With glucosamine, chondroitin and hydrolyzed collagen for better absorption! Alleviates joint pain associated with osteoarthritis. Maintains healthy cartilage, joints and bones. Non-medicinal ingredients: gelatin, magnesium stearate. Helps to alleviate joint pain associated with osteoarthritis. 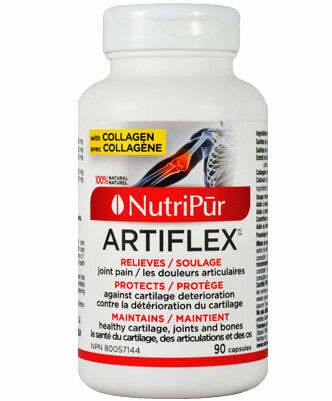 Contributes to the maintenance of healthy cartilage and joints. Consult a health care practitioner prior to use if pregnant or breastfeeding or if the symptoms persists. Adults: Take 1 capsule 3 times a day. Use for a minimum of 1 month to see beneficial effects. For a prolonged use, consult a health care practitioner.